These inscriptions are on the previous page. The Learmonths built ‘Yasmar’ on Parramatta Road. A DEEPER TONE IS GIVEN. “When thou liest down thou shall not be afraid. 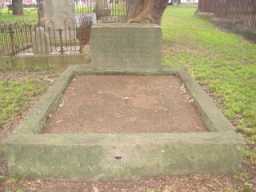 Ethel Belisario, died 19 Dec 1947, is buried in this grave. Archibald Ernest Ramsay was the 5th child if David Ramsay II and Kate de Mestre, daughter of Prosper de Mestre. Muriel Allard was the eldest daughter of Horace Bately Allard and Maria Cowlishaw Woolnough. Louisa is buried in the vault. DAUGHTER OF DAVID RAMSAY M.D. 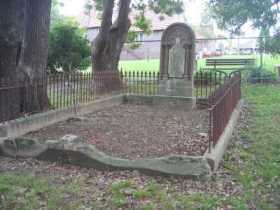 The ashes of Emilie Forde are possibly in this grave. This child's coffin is in the vault. There is no inscription. DEVOTED WIFE AND LOVING MOTHER. Mary Edith Daniel was the daughter of Edward Pearson Ramsay, married to Frederick Crofton Daniel. Margaret Isobel Coates was the daughter of Edward Henry Pearson Ramsay. She married first, James Douglas MacCallum, and second, Leslie Harold Coates. 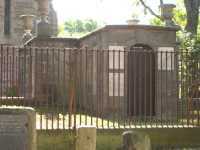 John and Emily Mills were close friends of the Ramsay Family. Annie was the wife of the first Minister at St David’s. Percy was the son of John Pope, the first Mayor of Ashfield.